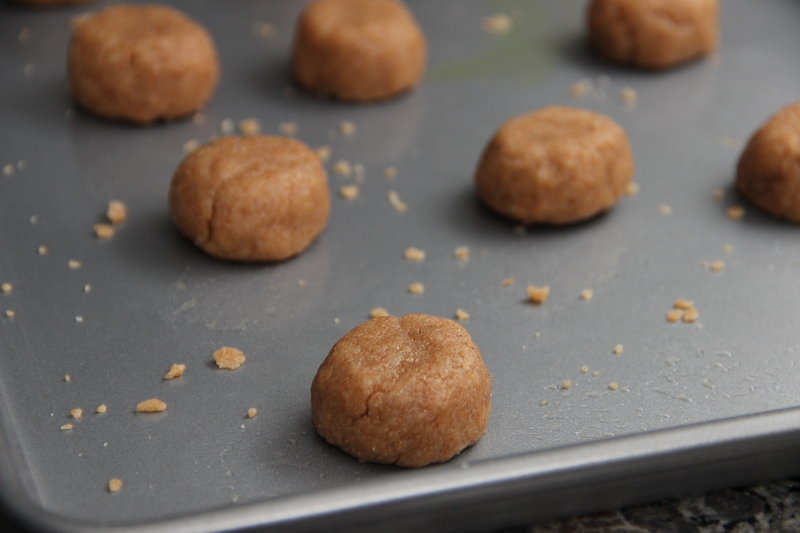 If you’re someone who kind of secretly likes sneaking tastes of the raw cookie dough more than biting into the final baked cookie, this recipe if for you. If you’re someone who is too full from having had too many “taste tests” of the cookie dough to have room for a baked cookie when it comes out of the oven, this recipe is definitely for you. All combined into one bite-sized treat. I guess I should say just one thing more: this is actually a healthier cookie recipe that includes some whole wheat flour, canola oil, and Greek yogurt. So it’s a dessert you can feel a little better about eating. Why not welcome spring with a fun, sweet treat! Here are all the ingredients you’ll need. Begin by preparing the cookie dough. Place all the following into a food processor: all-purpose flour, whole wheat flour, light brown sugar, white sugar, salt, Greek yogurt, canola oil, and vanilla extract. Sounds a little different from a traditional cookie recipe, right? First, I cut out a lot of sugar. 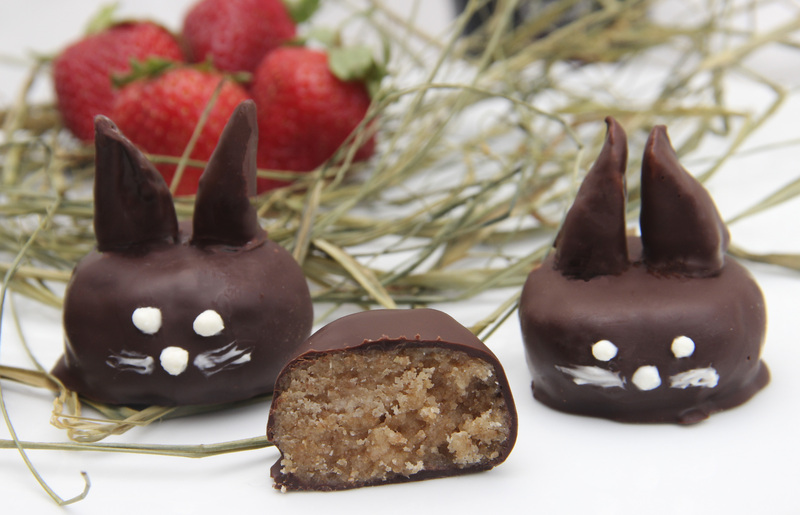 These bunny truffles are dipped in chocolate later, so they’re still really sweet even without adding much sugar to the dough. If you decide to try these, you’ll see – you really don’t miss it! Also, I used Greek yogurt in place of eggs. Meaning this gives you full rein to eat cookie dough without that little worry in the back of your mind about the tiny possibility of the raw egg making you sick. Last, I use canola oil in place of butter. As opposed to butter, which is full of saturated fat, canola oil is full of good-for-you omega-3 fatty acids. Omega-3’s prevent heart disease and have been shown to help prevent cancer, stroke, and arthritis. So why not make the switch in your cookie dough? Pulse until everything is well-combined. 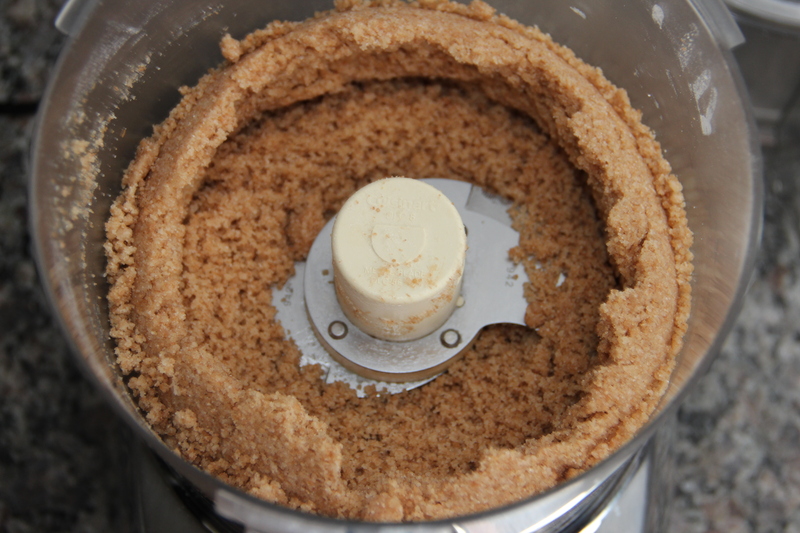 Alternative: you could also combine the ingredients in a bowl if you don’t have a food processor. I just think the food processor saves time and dishes if you do happen to have one. Combine the dry ingredients in a large bowl. Then the wet ingredients in another bowl. And then add the wet ingredients to the dry, and stir everything together. Since this dough doesn’t have butter or eggs, it’s a bit more crumbly than a traditional cookie dough. But it’s moist enough to grab heaping tablespoons of dough and form cookie-dough-balls with the palms of your hands. After you’ve formed a ball, place it on a cutting board or a baking sheet. Holding your fingers flat, carefully press down to create even, flat surfaces on the top and bottom of the ball. Having those flat surfaces will be very important later, when trying to get the “bunny ear” strawberries to stick! It seems weirdly important to me that I note that my hands are not this large! I got my husband to demonstrate so I could snap a photo. He’s now considering a side career as a hand model, à la George Costanza (also important for me to now say: completely kidding). I like adding strawberries for a couple of reasons. First, why not add something healthy to your dessert? 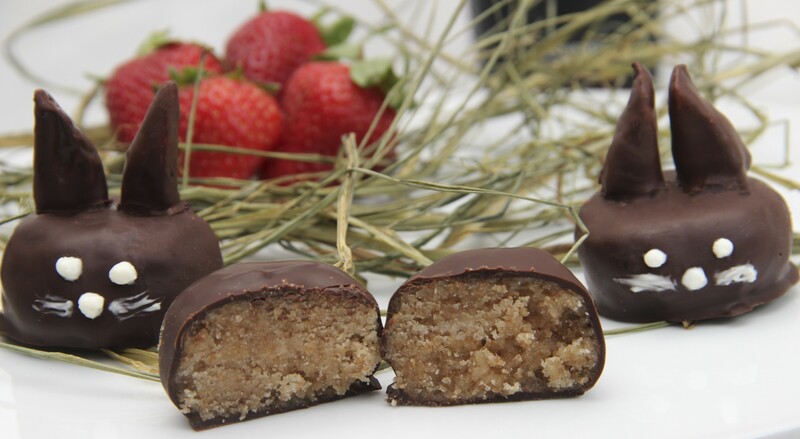 Second, what tastes better with chocolate and cookie dough than strawberries? 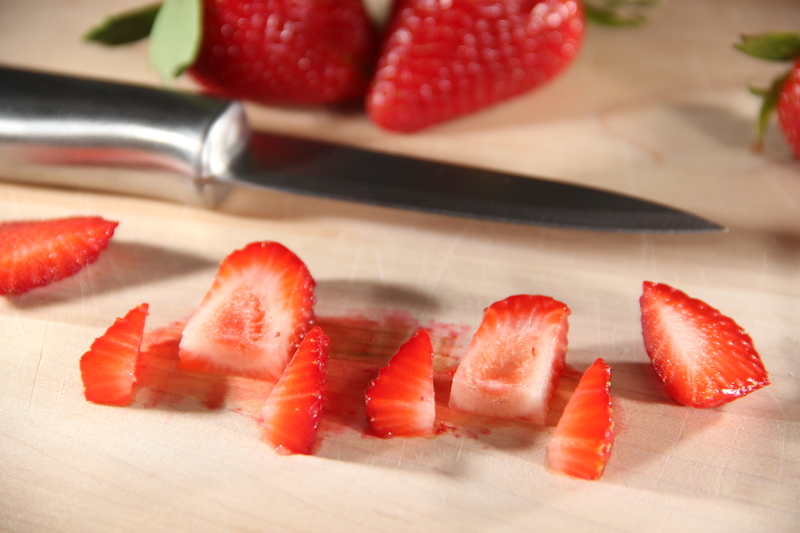 Cut the stems off the strawberries, making sure to create a clean, even edge. Set the flat edge down on your cutting board and cut down to create quarter-inch slices. Working with the center slices only, cut triangles from the outer edges. After you’ve created a couple “bunny ears,” test them out. Place them on top of a cookie-dough-ball. Make sure they fit. And keep in mind that once you dunk the bunny ears in chocolate, their size will increase a bit. Also make sure you’ve created a flat-enough surface on the cookie-dough-balls that the ears will stand upright. In this recipe, only small slivers of strawberries are used. Refrigerate the unused portions to serve along with the cookie dough bunnies! Place both the cookie-dough-balls and the bunny ears on a baking sheet and refrigerate for at least an hour and a half. 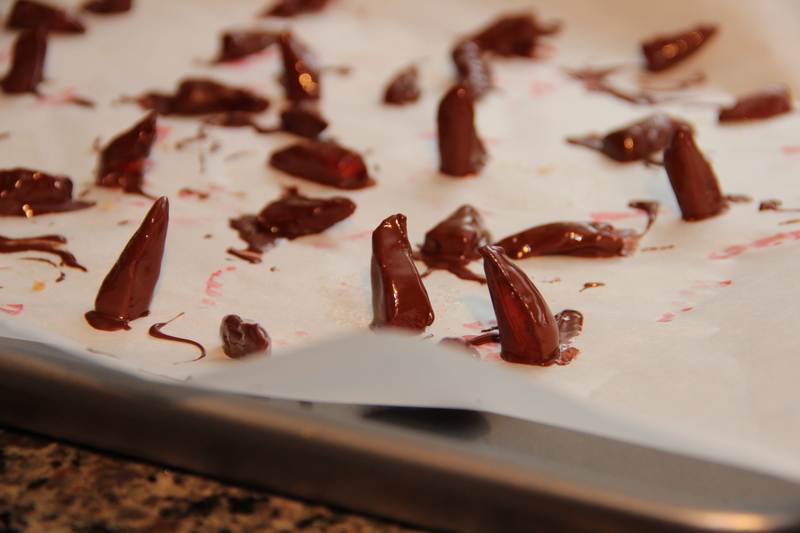 Next step: the chocolate-covered part! I use dark chocolate (rather than milk chocolate or white chocolate) because dark chocolate has higher levels of antioxidants and less sugar. And it tastes amazing with cookie dough and strawberries! 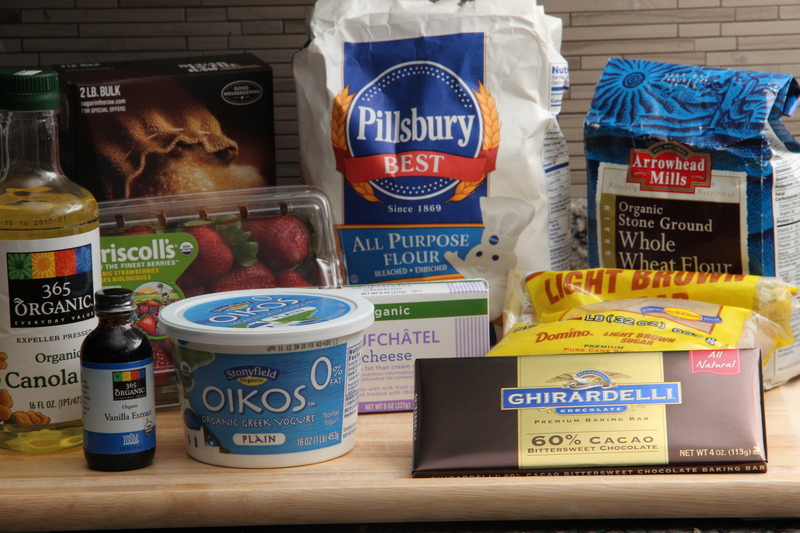 Place some dark chocolate in a large bowl and microwave in 20-second increments until the chocolate is just melted. Use two forks to place the first cookie-dough-ball in the chocolate. Turn it around on all sides to cover every inch in chocolate! Use one fork to scoop the cookie-dough-ball out and allow any excess chocolate to drain off. Then place it on a parchment-lined baking sheet. Be sure one of the flat edges is still at the top when you place it on the parchment! Heat up some more dark chocolate in a separate bowl. Important: Don’t use the same bowl you used for the cookie-dough-balls unless you wash it first. All of the old chocolate will burn when you try to microwave the second batch. And this causes the chocolate to solidify – not helpful when you’re trying to dunk tiny, little pieces of strawberry. 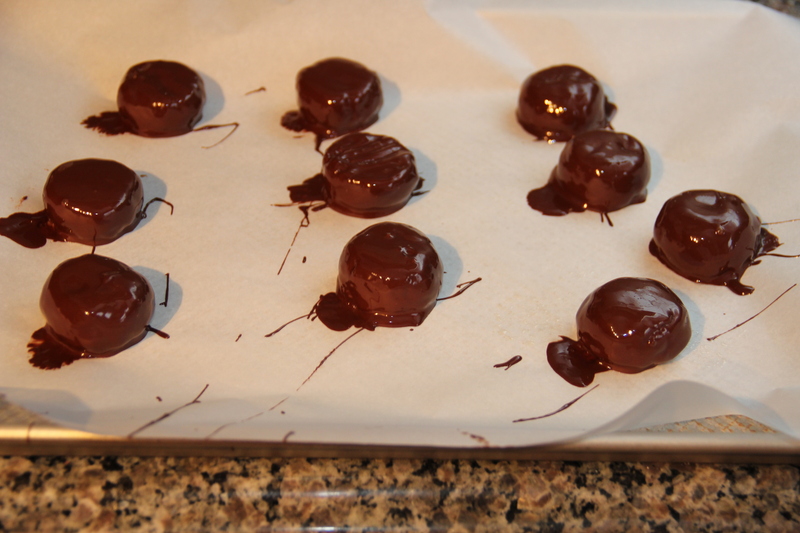 One other note: try to get the “bunny ears” to stand upright on the parchment-lined baking sheet after dunking. This will help ensure a smooth, even surface. As you can see, this only works about a third of the time for me. 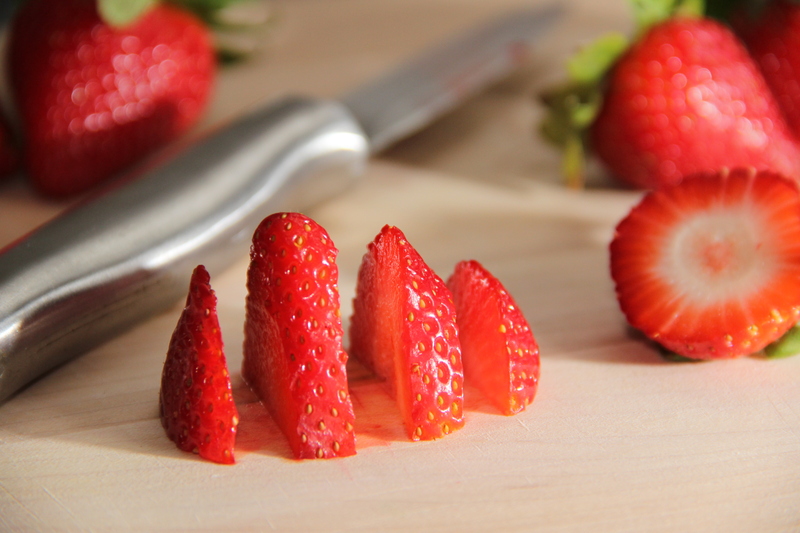 That’s why my recipe calls for more strawberry triangles than necessary – to allow for mistakes! Place both the cookie-dough-balls and the bunny ears back into the fridge to allow the chocolate to harden. Use a hand mixer to combine some Neufchâtel, Greek yogurt, and white sugar. 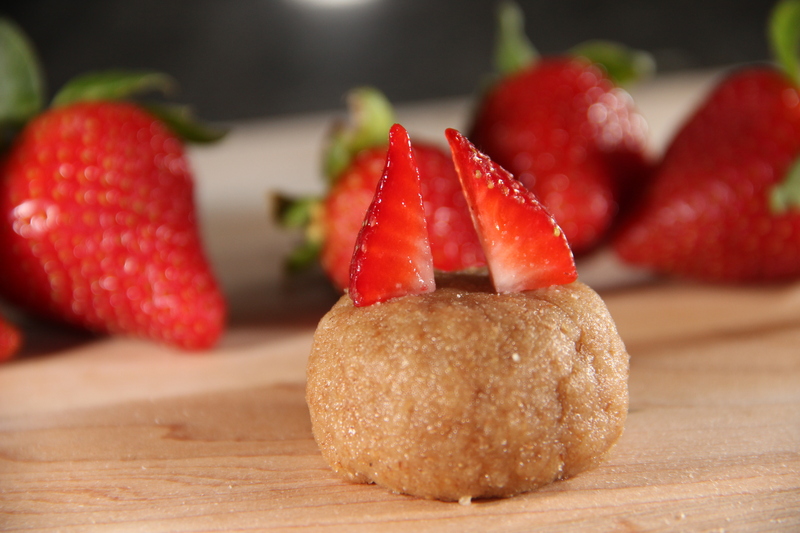 When it’s smooth and creamy, use a toothpick to place two dabs on top of a cookie-dough ball. 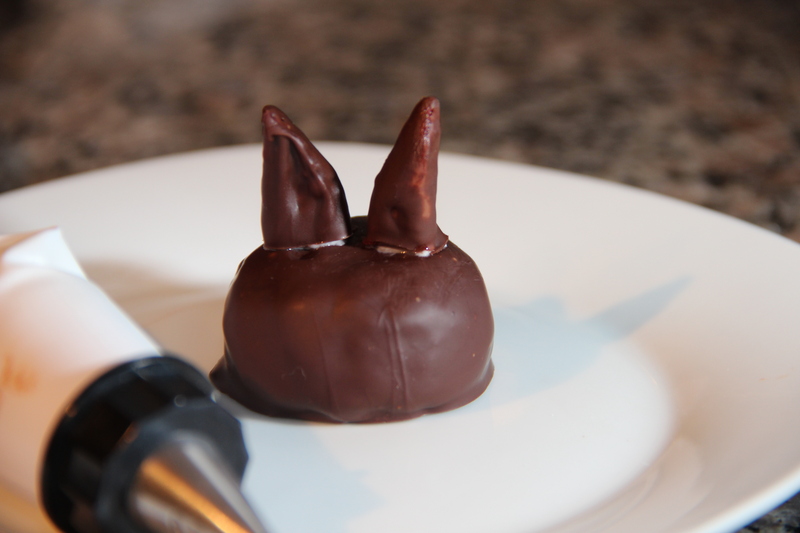 Grab two bunny ears and place them on top of the icing, securing them into place. Now use either the toothpick or a decorator bag to draw on eyes. Serve along with some of the extra strawberries, and you have the perfect springtime dessert. These are really tasty and really rich. 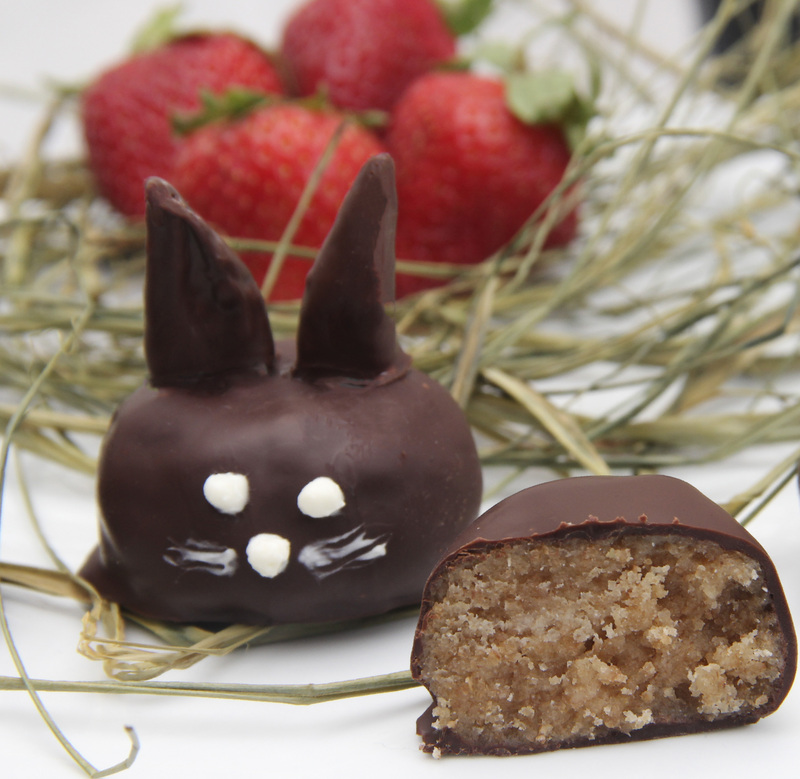 These little bunny truffles definitely require some time and patience. 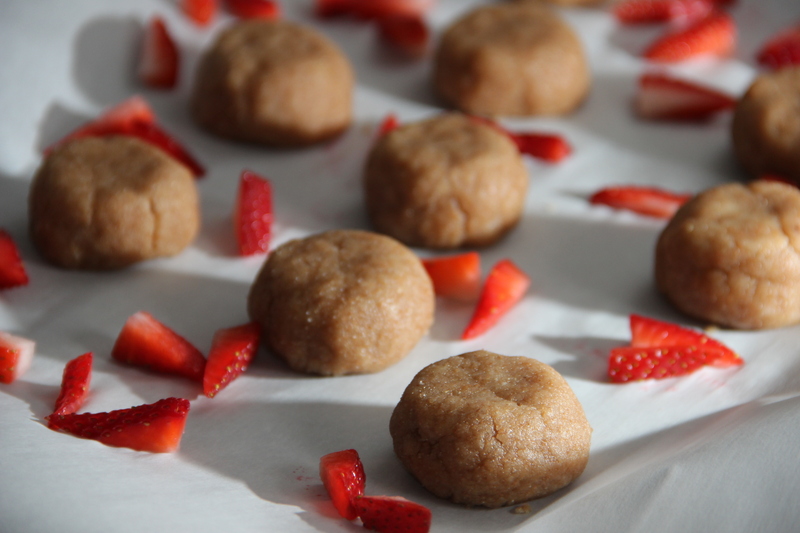 But in the end you’ll find yourself in Cookie Dough-and-Chocolate-and-Strawberry Heaven! Add the following to a food processor: all-purpose flour, whole wheat flour, 1 1/2 tablespoons white sugar, brown sugar, salt, canola oil, 2 teaspoons Greek yogurt, and vanilla extract. Pulse until all ingredients are well-combined. Grab a heaping tablespoon of dough and form a ball-shape with palms of hands. Holding fingers flat, carefully press the ball onto a flat surface (your counter or cutting board) so that the top and bottom of the ball have even, flat surfaces. Place on a baking sheet. Repeat. 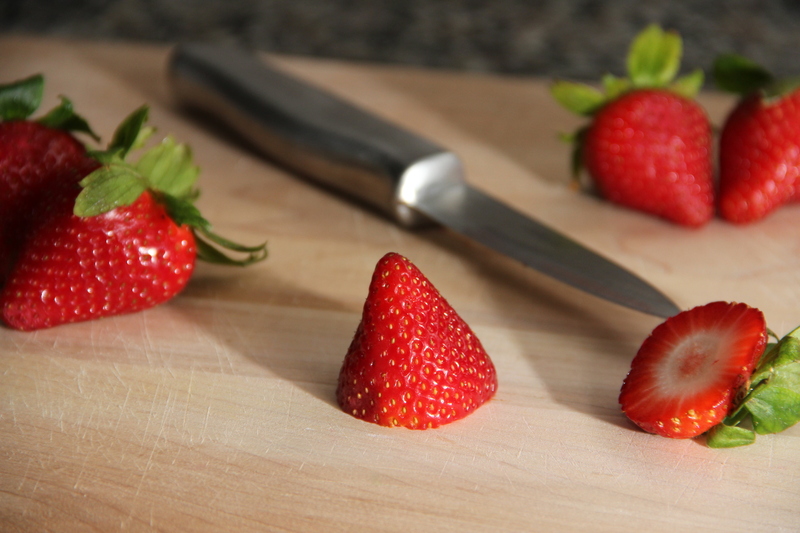 Cut the stems off the strawberries, ensuring the cut is even and forms a flat surface. Place the berry flat- side-down onto the cutting board and slice down toward the cutting board, creating quarter-inch slices. Cut triangles from the edges of the center slices to form “bunny ears.” Place two bunny ears on one of the cookie-dough-balls. Test that the cookie-dough-balls are flat enough to hold the bunny ears. And test that the bunny ears are the correct size. Repeat until about 40 bunny ears have been created. Place on the baking sheet along with the cookie-dough-balls. Refrigerate for at least 1 1/2 hours. Place 4 ounces of dark chocolate in a large bowl. Microwave for 1 minute and stir. Microwave for 20 seconds and stir again. If chocolate is not melted, continue to microwave in 20-second increments until all chocolate is melted. Using two forks, place the first cookie-dough-ball into the melted chocolate and turn over in the chocolate until all sides are coated. Use one fork to lift the cookie-dough-ball out of the bowl and drain any excess chocolate. Place on a parchment-lined baking sheet. 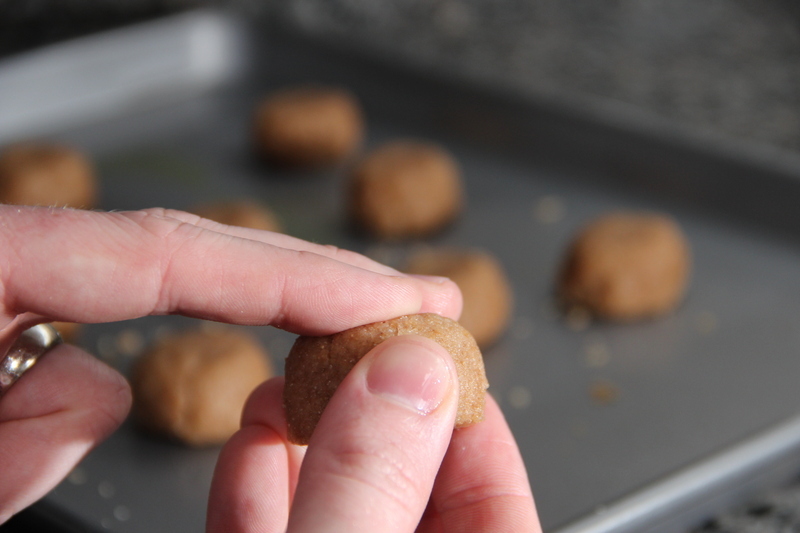 Ensure that one of the flat sides of the cookie-dough ball is at the top, facing upward. Working quickly, repeat until all cookie-dough-balls are covered in chocolate. Place 2 ounces of dark chocolate in a separate small bowl. Microwave for 30 seconds and stir. Microwave for 15 seconds and stir again. 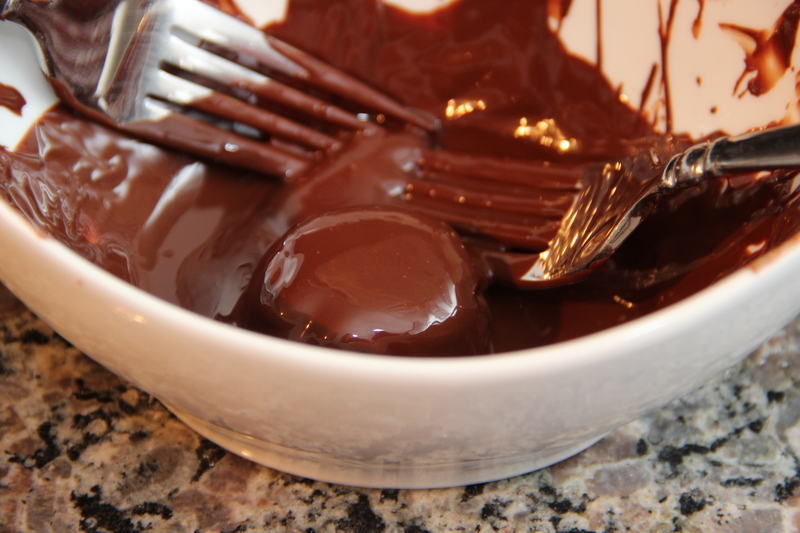 If chocolate is not melted, continue to microwave in 15-second increments until all chocolate is melted. 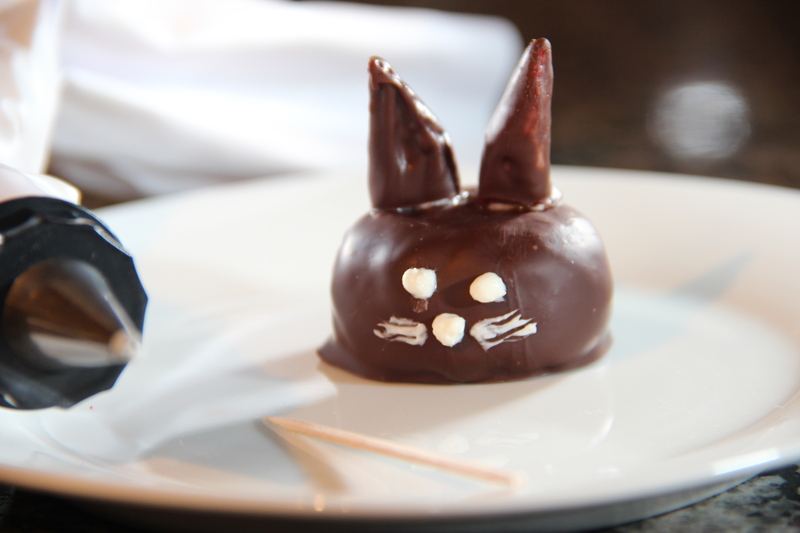 Using two forks, place a strawberry bunny ear in the melted chocolate and turn over in the chocolate until all sides are coated. Use one fork to lift the berry and drain any excess chocolate. Place, standing upright if possible, on a parchment-lined baking sheet. Working quickly, repeat until all bunny ears are covered in chocolate. Refrigerate both cookie-dough-balls and bunny ears for at least 1 1/2 hours. Combine Neufchatel, 2 teaspoons Greek yogurt, and 1 tablespoon white sugar in a mixing bowl. 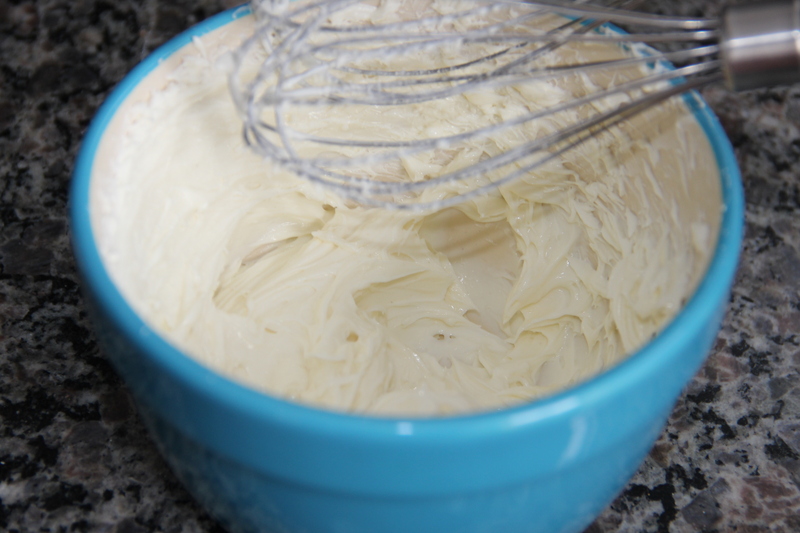 Blend with a hand mixer until the icing is smooth and creamy. Using a decorating bag or a toothpick, place two dabs of icing on top of one of the cookie-dough-balls. 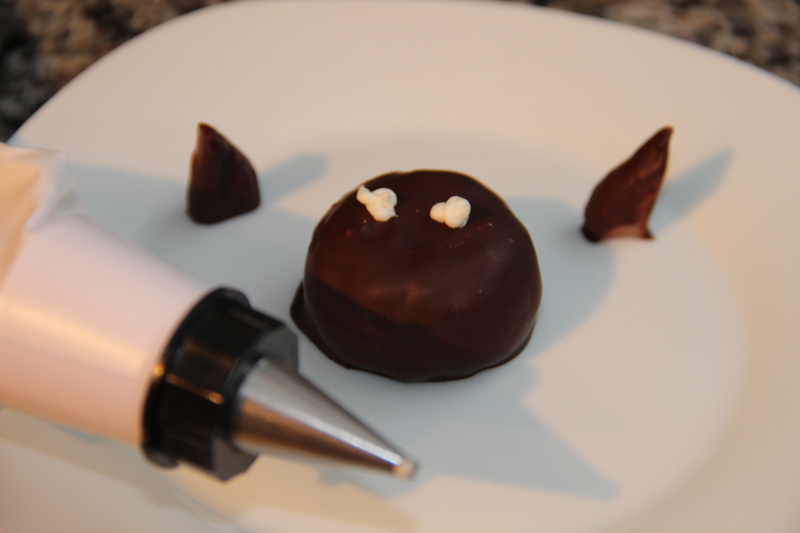 Place a bunny ear on each dab of icing, ensuring they stand upright. Use the decorating bag or a toothpick to draw on eyes, nose, and whiskers. Repeat. Serve with remaining strawberries. Yum! Those look super cute! I bet my son would think that these are pretty awesome. These are the cutest and most delicious idea which is fast and simple as well for Easter! Do you mind if I reblog this with my easter post next week please??? Thank you 🙂 Yes, absolutely you can. So cute … and pretty – wouldn’t mind having a couple NOW! For me to do – forget … patient don’t excite with me. Have done chocolate covered strawberries hundred times – but that is what I can stretch myself to without losing it. I hear you – this is a once-a-year kind of recipe for me! Do you get faster with time? Or do you think most recipes underestimate the amount of preparation time required? Great photos. This is very creative and really makes me want to go out and buy Cadbury and Easter candy! P.S. 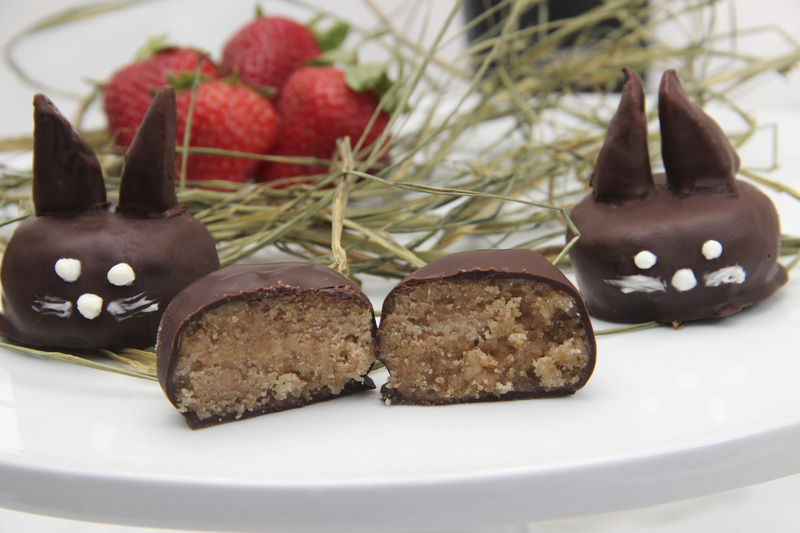 These chocolate covered cookie dough bunnies are a great idea! These are soooo cute! I especially liked the fact that you didn’t use eggs for your cookie dough. I always loved cookie dough as a child and didn’t worry about the raw eggs, but now I would have been afraid to eat it. Thanks for a perfect Easter Treat. Gorgeous idea that I’ll try for Easter…. I’ll try not to eat all the dough before making the bunnies! These are so cute! My niece would love them, and I even think I could save room for one (or two?!) as an evening snack with some whole berries! Very impressive little treats! I like the no-bake aspect to this recipe as well as the Greek yogurt – I love using it in baking and the combo of strawberry, chocolate and cookie dough just gets my taste buds all riled up! You put a lot of hard work into these cute little guys – nice job! These are so cute…I bet they taste good too. Adorable! And they sound delicious as well. Oh, these are just incredibly cute! I definitely have to make these for Easter! Wonderful post and so creative. And thanks for stopping by our little blog. Nothing like chocolate dipped cookies, right? Cheers! These look wonderful! Extra virgin coconut oil, organic, might be a good choice to try. I like the first cold press. Can’t wait to try these! it’s looks hot and as a desert i would like to take this. These are so adorable and creative – I live the strawberry ears! YumYum – I’m sending this to my Grandchildren! (Well, to their mother…) Thanks.